Mornings at our house used to be chaotic. Some mornings still are. My husband and I both work full time. Luckily, I have a great husband who helps out with everything around the house. Even though we both get things ready in the morning, there was a time it was extremely chaotic. It was ok when we just had one child. Then we had a second child and the chaos magnified. I’m not sure how adding one little person to the mix could do that, but it did. -Unintentionally be short with each other. -Rush out the door with not a minute to spare. Every morning was a nightmare. I would feel stress for at least the next half hour after leaving the house, even though that part of the day was done. Needless to say, it was not a good way to start the day. One morning on the way to work, I was thinking about this dilemma. What made the mornings chaotic and how could we solve the problem? In short, everything which had to get done! 1. Prep everything you can the night before. Think about what does not have to be accomplished in the morning. Did you write those things down? Those are the items you can prep the night before. The main excuse I get for this step is “I’m too tired.” I understand that. The last thing I want to do after the kids go to bed is prep for the next day. I would rather plop down and watch tv, write, or go to bed. Although prepping is not my favorite thing to do, it sure helps in the morning. 2. Make sure you are completely ready before the kids get up. I like sleep. A lot. When I went back to work after having our second daughter, I realized simply being up before the kids were up was not going to cut it. I was going to have to be completely ready before their little eyes opened up. For me, this meant showered, make up on, hair done, dressed, coffee drank, and my daily reading. Does my morning always turn out like this? Nope. Some days the girls decide they are going to get up 5 minutes after I do…at 5:30 am. Thankfully this is not the norm. When I am completely ready, I can then focus on their needs once they are awake. 3. Have set “jobs” each morning. The prep you have done the night before makes finalizing lunches and other items much less complicated. However, there are still numerous things that have to be taken care of in the morning. Breakfast has to be made and lunches need to be finalized. The preschooler needs to be poked and prodded to get dressed, eat breakfast, get her hair done and brush her teeth. The baby needs to eat breakfast and *most* of the time we get her dressed before taking her to the sitters. There is still a lot that has to be done to get the kids, and us, out the door on time. We figured out early on there are certain parts of our morning routine that we like over others. And thankfully we each like doing what the other would rather not. The hubs loves to make breakfast, which means he takes care of all of the food in the morning, including finishing up lunches. I usually handle corralling the kids and getting them to the breakfast table and then finish up getting the preschooler ready. This doesn’t mean this is the way it always is, but it allows us to each have something to own in the morning. This also means we don’t get in each other’s way or assume the other person is going to take care of that one thing neither of us want to do. Ensuring mornings are a little less chaotic and a little smooth(er) with kids can be achieved. It takes some planning in the beginning, but once you find your groove, the process of each morning is much smoother. Are mornings still chaotic for us sometimes? Yes. When they are more chaotic than normal, odds are we skipped one of these steps. 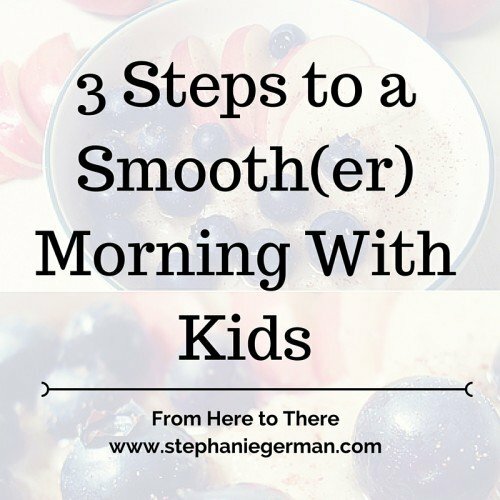 What can you do to make your mornings smooth(er) with kids? Can ripping off a rear view mirror really make you never look back? The concept is great in theory. Ripping your rear view mirror off of your car so you cannot look back does not work in reality. If anything, he just made himself a hazard to other drivers when he is on the road. Your past does not define you, it shapes you. Every experience you have shapes you to be the person you are and the person you are becoming. Every person has a worldview. A loose definition of a worldview is your framework or ideas about the world. It is one’s background, beliefs, experiences, values, and inherited characteristics combined together that makes your worldview. Your past, your worldview, shapes you. Jimmy Butler may not want to look back or remember his past, but it is a part of who he is. And that is a good thing. 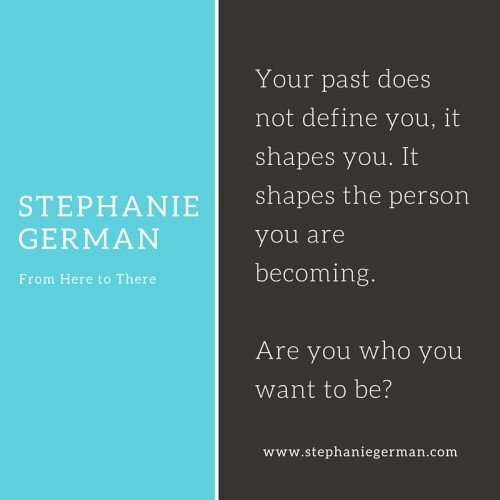 Your past is a part of who you are. But it does not define who you are. If you had a rough past and you do as Jimmy Butler did, your past can shape you to become a better version of yourself. As Jimmy stated, he worked hard to get where he is here. His past shaped his actions which in turn has helped him get to the place he is in. Your past shapes your behaviors and actions. If you don’t like who you were or who you are, then you can choose to rewrite your future. You can take steps and make goals to become the person you want to be. Your past does not define you, it shapes you. It shapes the person you are becoming. Are you becoming who you want to be? As I sat listening to my boss give an overview of the training that was about to take place, I looked at the faces of my co-workers and new immediately none of them cared about what was about to take place. The reality is the training I was about to do in conjunction with my boss was very important. Working with patient information, we were obligated to follow HIPAA (keeping your personal information private). We were about to teach nurses, office assistants, and admitting interviewers a very simple, yet important task. It would add to their already packed workload. I knew the importance of the training as did my boss, but in the end, I wasn’t so sure. The last thing any staff member wants to do is sit through another training. This is especially true when the employee feels like they are in meetings all of the time or they have a heavy workload. Learning a new process when you have already learned an entire system can be frustrating. Your employee believes the program they use works just fine. The process in place is great. Learning an entirely new system can be, frustrating. It becomes even more frustrating when you switch systems just to go back a year later to the system you were previously using. This happened with the company my husband works for. If you work for an innovative and thinking organization, odds are that you look for the most effective tools available. Sometimes there is a change in technology that the industry must take into account and staff must be trained. This can mean changing systems more frequently than you anticipate. If you make a change for change sake, you are going to have disgruntled employees. No one likes to go to trainings, especially when they do not understand the value of what they are learning. Engaging the staff with different senses during the training will help them retain the information better. Here are 6 steps to a successful training, 6 ways you can make the training worth your employee’s time. One of the main problems with the training that day is vision was not properly cast. The new process was in place because of a law. We all understood that. It was presented in a dry, straight forward manner, which left the staff annoyed at the new process they were learning. Telling your staff how this new procedure or software will help them, the organization, and potential clients help to create buy in to what you want to put in place. After you cast vision, but before you dive into the information, explain the new process. Giving an explanation, an overview, of how the new process will fit into their workflow will help them see another piece of the puzzle. Now that you have explained the process or software and what it can do, show them. I was able to walk the staff through each step. I had them watch me do it the first time. I explained what I was doing with each click of the mouse. I asked the staff to keep questions until the end, until they had a chance to do the process on their own. This isn’t always what I would recommend. In this instance, I knew that once they started doing the process themselves, it would begin to click for them. If it didn’t begin to click for them, then I would be happy to help. Once you have shown the staff, the staff needs to do it. This is where each staff member having their own laptop or access to a computer lab comes in extremely helpful. For many people, the new information will not click until they start doing it. Having a hands on experience allows your staff to interact with the information in a new way. If you include a handout with the new process or software (which you should), make sure to hand it out at this point so they can review the document, reading and engaging the information on their own, as they move through the process. This happens more often than you could imagine. Not all people learn at the same rate. Some read slower than others. Some older individuals are not as quick on the computer. Some simply have a hard time navigating the new process/software. Walking alongside your staff while they are learning this new information is the epitome of servant leadership. We should never ask our staff to do something we aren’t willing to do. Helping them process and digest this information is what we are supposed to do as leaders. Eye rolling and snide remarks when a staff member is having trouble with the process will not help with staff engagement. At the end, never assume that all questions have been asked as staff are going through the process on their own. If the training permits, asking your staff along the way if they have questions opens up the lines of communication. It gives them a chance to speak up when they may have kept quiet previously. Telling staff there are no stupid questions and reinforcing that you want them to leave the training with a good grasp on the information will also open up the lines for communication. We retain 10% of what we read. We retain 20% of what we hear. We retain 30% of what we see. We retain 50% of what we hear and see. We retain 70% of what we say. We retain 90% of what we do. 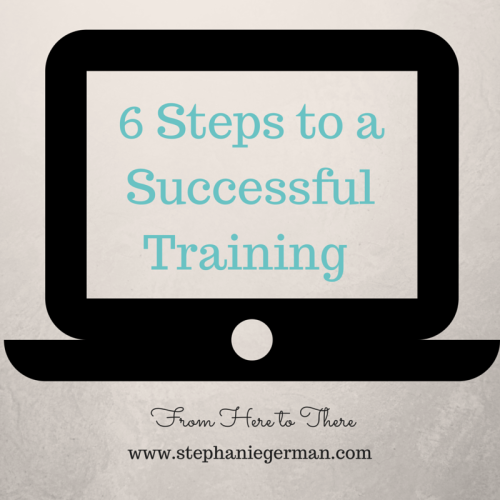 What else can you do to ensure a successful training? Share below! I am never as frustrated in my work or in life when I have to focus on my weaknesses. I don’t thrive on being creative (painting at least) or being left alone for long periods of time. When either of these things happen, I’m usually miserable. Often, we think we are supposed to work on our weaknesses instead of our strengths. I believe that we need to do just the opposite. My all-time favorite line when it comes to explaining one’s weaknesses comes from the TV show The Office. If you work in an office setting, then odds are you can resonate with the show. The desire to work on our weaknesses, I believe, comes from the idea that we can be anything we want to be. That we must improve on the areas we don’t have much talent in so that we can be well-rounded. I think we need to stop focusing on being well-rounded and start focusing on our natural talents that are our strengths. The book, Strengths Finder 2.0, gives you an access code to complete an assessment which produces your top five themes, or strengths, out of a list of thirty-four. Obviously, this assessment does not, and cannot, take personality nuances in to consideration. However, it does take into consideration that the strengths are a list of raw talents and as you build upon them, and invest in your talents, they become your strengths. 1. Buy the book. Take the assessment. I bet you don’t even know what your strengths are though. Am I right? If you don’t know, then I encourage you to spend the $15 to get the book which has the assessment code. $15 may give you a level of self-awareness you did not know was possible. There are a few short chapters (if you can really even called them that) which introduces the premise of the book and the assessment. The code for the assessment is in the back of the book. You should set aside 35 minutes of distraction free time to take it. Once you have taken the assessment, the program gives you a printout of your top five strengths. There are several PDF reports that are created based upon your assessment. Here is a list of the 34 themes with a brief description. Along with these reports, the book has practical information in it, including how to get along with coworkers who have specific strengths. Take some time to think about how your strengths play into your real life. Not just your work life, but the things that you enjoy. The things that you are good at. For instance, one of my strengths is Achiever. This means exactly what it says. I like to achieve things. I set goals for myself, I challenge and motivate myself. I will write down an item I have already completed on my to-do list simply so I can mark it off. 4. 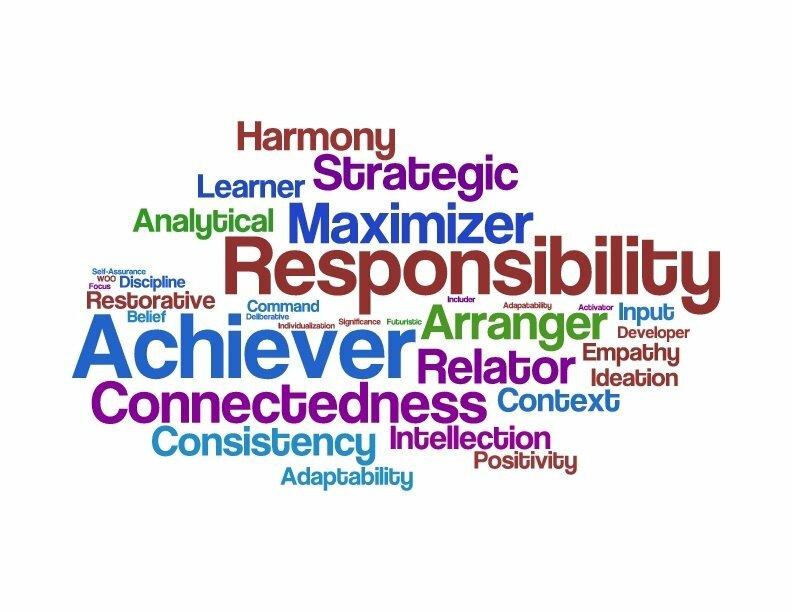 How does your job connect with your strengths? Now think about your strengths as it relates to your job. Do you find that you use your strengths in your job? If you struggle with your job, it may be because you are working out of your weaknesses and not your strengths. At least that is the case for me. I’m currently in a position where I am not using my strengths. Some days I go home weary and frustrated because I am not fulfilled each day. Although I am learning valuable skills, I am not working out of my strengths. Luckily I work in a place that had us take this assessment. The plan is to evaluate everyone’s strengths and to begin to assign tasks, when possible, to utilize their strengths. After reviewing your five strengths, and thinking about your real life, it’s time to think about what strength you want to improve upon. For example, if one of your strengths is communication, you could figure out which form of communication you are best at and begin working on that. There are some great suggestions in the book on how to improve upon your themes. Focus on improving your strengths. Find joy in what you are good at. Focusing on your weaknesses can be frustrating and tiresome. There is no need to drudge through life focusing on what you aren’t good at. Knowing your strengths is just one step in figuring out the type of life and occupation you want. When I took the assessment for the second time, years apart, it was interesting to see the differences. As I looked back as to how my life has changed, the strengths then made more sense. Knowing your strengths is one piece of the puzzle that will give you a greater level of self-awareness to live the purposeful, prioritized life you want. Do you know your strengths? If not, go find out! Quotes from individuals who have gone before us down the path of life are inspiring and instrumental in shaping who we are. They shape who we become. When we read and digest information, it helps shape our worldview on that particular subject. I wrote a book on servant leadership as my final project for my Master of Arts in Organizational Leadership. To date, it was one of the most difficult projects I have taken on. Instead of it sitting on my hard drive, I have decided to have the book edited to self-publish on Amazon. I have had the draft edited but have not yet done the revisions. I guess it is time for me to take my own advice, make appointments with myself, and begin to work on those revisions. In the book, I discuss the difference a leader can make by being a certain type of leader. I talk about the difference between leading and managing. Communicating clearly, empowering followers, and showing the way are what set apart mediocre leaders from great leaders. I think the book is chalk full of good information and hope you do to. Those in positions of leadership need to be intentional about their own development as well as the development of their followers. Being a leader is not a position that should be taken lightly. Unfortunately, we have all seen the individuals who have somehow made their way to leading organizations who probably should have minimal interaction with the others. Leadership quotes can inspire us to be better leaders. Below are 11 leadership quotes to make you think. Some of these are in my book, others will be added. These quotes are all great. However, a quote is no good unless we understand how to apply it appropriately in our leadership context. There are so many great leadership quotes from many great leaders. With the internet, quotes are available at our finger tips. As I go back over my first draft, I undoubtedly will add more quotes as they fit into the text. 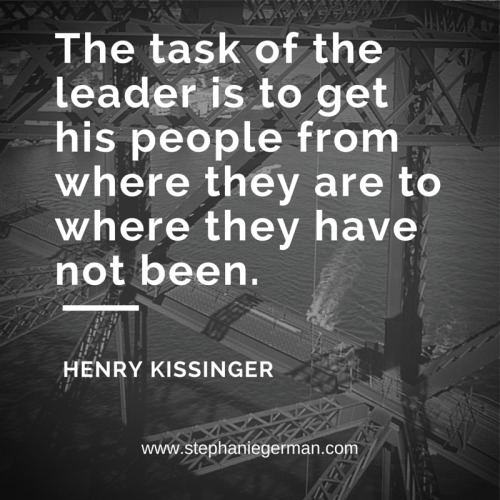 Do you have a favorite leadership quote? Share below! If we define leadership as anyone who has influence, we can define leadership in the same way for cartoon characters. I have a three-year-old which means we watch a lot of Disney Junior. Some of the shows are educational, and some are just downright horrible to watch. It is amazing to me how many now have a leadership principles as the main lesson in the show. The other day we were watching Sheriff Callie on our AppleTV. The best thing about Apple TV, no commercials. No commercials means the child does not desire all that is advertised. But I digress. My husband says what he has learned from Sheriff Callie is everything is better with a magic rope. While this may be true, most of us will never have a magic rope. In one episode of Sheriff Callie, Hike to Wish Mountain, Deputy Peck says he knows the way to the top of Wish Mountain “like the back of his wing.” They all wanted to make it to the top of Wish Mountain in time to see the meteor shower and to make a wish. Clearly, Peck was thrilled to be able to lead his friends up to Wish Mountain. As they start on their journey, it becomes obvious that Peck doesn’t quite remember the way to go. Or how to keep them all safe. He is so excited to be the leader that he isn’t willing to tell them he doesn’t quite know the way. How I wish that statement was true across the board. I have followed many leaders who acted like they knew it all, even when it was clear they didn’t. They would not listen to anyone’s suggestions regarding the situation in which they believed they had all of the answers. There is nothing more discouraging than working for someone who is the smartest person in the room. The person who is never wrong. The leader who makes up an answer even if it isn’t close to being correct, simply to have an answer. A leader who diminishes others abilities and thoughts. I have worked for both types of leaders. The one who is never wrong and the one who admits when they make a mistake. When my leaders have admitted they are wrong it makes them human. It makes them more approachable in general, but especially when I have made a mistake. Work on becoming the leader who is open to suggestions. Work on becoming the leader who is approachable, for both the good and bad. Work on becoming the leader who admits when they don’t know something. If you have never been a leader who has admitted mistakes before, the apology may seem like a one off and cause some mistrust at the beginning. However, when a leader chooses to put their own comfort to the side and admit when they are wrong, they begin to change the culture of the organization. The best piece advice (after admitting you were wrong or don’t know) is to invite those you lead to find the answers or gather everyone together to brainstorm the answer. Create buy in. People want to be engaged in their jobs. Help them. 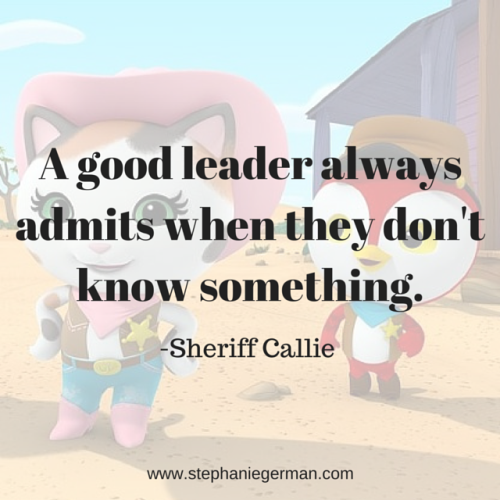 I am thankful for the leadership lesson, for what I learned from Sheriff Callie that day. It was a great reminder for me as I navigate leading that I do not have to know all of the answers. Admitting when I don’t know something, when you don’t know something, can change the culture of your organization. It eventually equates to greater respect. This in turn gives us a chance to utilize our followers to find the answer. Empowering employees will make them feel more valuable to the organization, creating greater loyalty. People want to feel useful, not that they are being used. Has there been a time when you pretended like you had the solution to the problem even though you had no idea what you were doing? Do you think a good leader admits when they are wrong? Share below. When I go to work, I look to my boss, who is supposed to be the leader, to be an example. It often happens that what is said and actions displayed do not match up. When that happens, my level of respect goes down for my supervisor. I have found that this is true for me being a parent as well. My daughter has a way of reminding me when my words and actions do not match up. She is only 3, so it’s not as detrimental as it will be when she is 16. Thinking through these two scenarios, I have found great similarities between the times I have led a program and when I have led my kids as their mom. As a leader, you have people under you. These people are called employees, or followers. They watch everything you do and say. Sometimes they ignore you completely. In a business, those that are disobedient are reprimanded. And eventually fired. As a parent, you have people under you. These people are called your children. They watch everything you do and say. They let you know when what you say and what you actually do does not match up. Sometimes (most of the time) they ignore you completely. In a home, those that are disobedient are reprimanded, and there is usually screaming involved, because timeouts are clearly the worst thing in the world (amiright?). When we ask our followers to do something, they are watching to see if we are going to act in the same manner we are asking of them. As a leader, if I don’t show the way, they will do as they please. This is true in my home as well. My three year old, who is going on sixteen, has begun to repeat the words and tone I use. All too often I do not like what I hear. To change the story being told in our house, I have to change the way I speak to, and interact with, my three year old. This doesn’t mean I let her do whatever she wants, whenever she wants. Clear boundaries need to be set. However, there is nothing more telling than hearing your child repeat the words you have spoken to them. To the change the story in your organization, you as a leader need to be willing to serve those you oversee. If you are not willing to do the work, why should those you lead willingly go about doing it? You begin to take long lunches, your employees see that and follow suit. You sit in other offices gossiping, others notice and follow suit. You should not expect your employees to behave in a manner that you are not willing to behave in yourself. 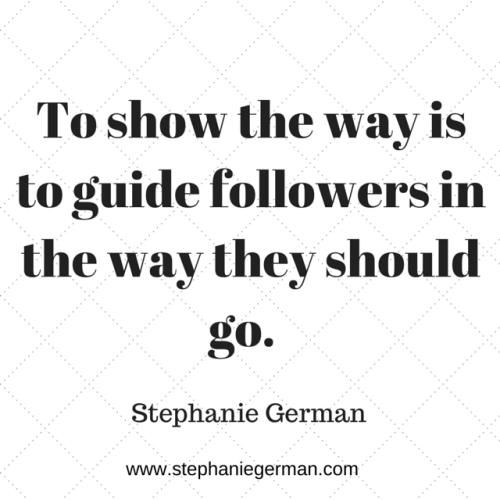 To show the way is to guide followers in the way they should go. Shown integrity leads to a higher level of respect and loyalty. Integrity and honesty are shown time and again as the two highest qualities employees and followers desire out of their leaders in studies conducted. There is a higher level of respect when you as the leader do what you say and show the way. Whether you are the CEO of a Fortune 500 company or the CEO of your home with 5 little ones around you, make sure you are showing the way. Eyes are always watching. In what ways are you being a person of integrity with those you influence? I’ve been struggling lately with the definition of success. My definition of success. I wonder if it’s time I start redefining success. We are told that the definition of success is graduating from college and establishing a great career. I graduated from college, started what I thought was going to be a career, have made several detours, earned my Masters in Organizational Leadership, and am currently working a job that has nothing to do with my degree or strengths. I am now in a place where I think I should have a career established. Instead, I have a job. Doesn’t everyone have it all together and figured out by the time they are 30? I have my Masters degree. I have had multiple jobs. But no set career path. Success is defined as the accomplishment of an aim or purpose; achieving a goal you set. From the time I could remember, my goal was to work for a corporation in business and become an executive. I was indoctrinated with the idea that I needed the high salary, big title, and large house. Besides, that is what is emulated in the world. I know that I have bought into that. Being an achiever has allowed me buy into it. And my head believes this definition of success. The other day, in an online community I am a part of, one of the participants was bummed due to the fact that a product he was wanting to launch was launched by another company/individual. He was reminded by several of us that due to who he is, he will connect with a different audience than this other company. He has his own worldview, personality, and experience that will connect to a specific audience. If you are an entrepreneur, we are told that to be a “real” business you must have a Facebook page and twitter handle and now periscope with thousands upon thousands of likes. The reality is that is not true. One can be successful with a couple hundred likes or followers if they have connected with the right audience. 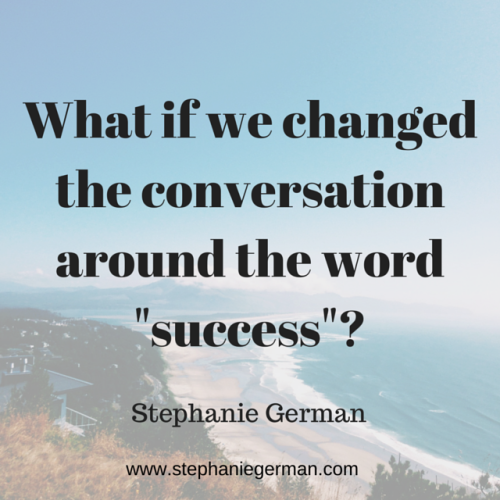 What if we changed the conversation around the word success? What if we redefined success as the legacy we leave behind? This new definition of success does not have to do with the big title. Or amazing office. Or the great perks associated with a corporate job. The items that no longer matter once you are not around. What if the new definition of success included the impact that you made on the lives of those around you that spanned for generations? When we live out our purpose in this life, we will be successful. We need to learn that when we invest time and resources into what matters, into what is eternal, we have become successful. My new definition of success is whether I am living out my purpose or not where I have been placed. When I live out my purpose in this life there is great joy and fulfillment. I can make a difference where I am, even without the large office and big title. I can influence those around me by engaging in positive conversation that moves the organization forward. I can challenge the status quo to make the organization run smoother. Where my definition of success has changed the most is how I am investing in my family and kids. I know I need to be available for doctor appointments and conversations at the end of the day. My definition of success is investing in the time my three year old needs of me, including the thirty questions that somehow made it to right before bed time. This means I put aside the things that do not matter, the things that the world says matters, and live a life that allows me to be fulfilled in my new definition of success. I still struggle with which definition of success I want to follow. The definition that says I need to look important to the world and the definition that says the greatest job I will ever have is raising my little ones. This is another step in the balancing act of life. One thing I know for sure, is I want my kids to know without a shadow of a doubt that they come first. How do you define success in your everyday life? Do you think you can have it both ways? With the use of technology today, we can work anywhere, anytime. This provides more flexibility in how our jobs are accomplished, and when they are accomplished. This can be a great asset. Without the appropriate boundaries, we can see technology slowly hurting our families. There was a study done two years ago by Accenture stating technology allows employees to be flexible with their schedule and that flexibility is extremely important to their work-life balance. However, 70% say that technology has allowed for work to be brought into their personal lives. That is a large percentage of individuals who believe technology creates work-life balance struggle. Technology blurs the workday boundaries that used to be clearly defined. Several years ago, I was promoted at work and was given another person’s job on top of my current job. This led to extremely long work hours and taking work home with me. I was near burn out when I realized I did not have boundaries in place that helped me to thrive at work and at home. I checked my email at night, took my computer home with me every night, stayed late at the office, and even checked my email, while on vacation, in Hawaii (seriously, what was I thinking?!). I read a book that described me; Mad Church Disease: Avoiding the Burnout Epidemic. And it freaked me out. I realized if I continued down the path I was on, I was going to burn out very quick. I made a list of what I could do to create balance in my life realizing technology was here to stay. I realized that a big issue was having the technology at my fingertips. I also needed to be realistic about the use of technology when I had a heavy workload. If you have your smart phone connected to your work email, turn off your work email daily. As I drove home from work every day, I turned off my work email on my iPhone. It was as easy as going into settings, mail/contacts/calendar, selecting my work email and sliding the green button over. This way, I didn’t have the urge to check my email all evening. I didn’t have the constant dings letting me know a new message had arrived. Don’t bring your lap top home. Seems easy, right? I struggled with this one, especially the first few weeks. I fought the urge to bring it home. I thought to myself “I will only finish that one ______ if I take my computer home”. Leaving your computer at work ensures that you will not do work that you can only access from your computer. Looking at the calendar at the beginning of the week will help you gauge what to expect in the week ahead. Do you have meetings in the evening? A big work project that will take extra time? Knowing in advance can help you plan out your week. On Sundays, my husband and I discuss our upcoming week. We talk about both work and family obligations to make sure we are on the same page. This allows us to discuss any work obligations that do not fit into our normal routine that would cause one of us to work late or have to bring unwanted technology time into our home. 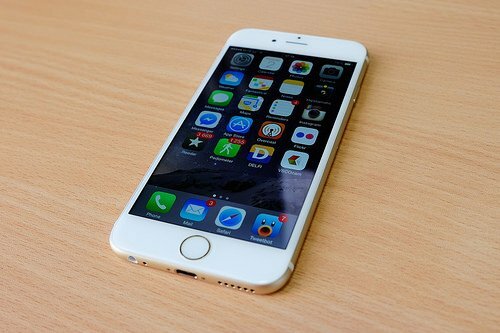 Your cell phone may be the only phone you have at home. You may not have a land line. We have not had a land line for 6 years. This does not mean you have to have your phone on your hip every second of the day. Set your phone down, turn the ringer up, and be free from technology for the evening. Only 15 years ago the majority of the world did not have cell phones. When you called someone’s house and they were not home, you left them a message. Many did not have answering machines 20 years ago. Delayed gratification was still in place. And everyone survived. You do not have to be available 24 hours a day. This is how I was able to ensure that technology didn’t take over my life 24/7. I made sure I was fully present at work during work hours and fully present at home when not at work. This made all the difference in the world for me and my family. These are boundaries that are still implemented years later. Does technology impact your work-life balance? I would love to discuss below! 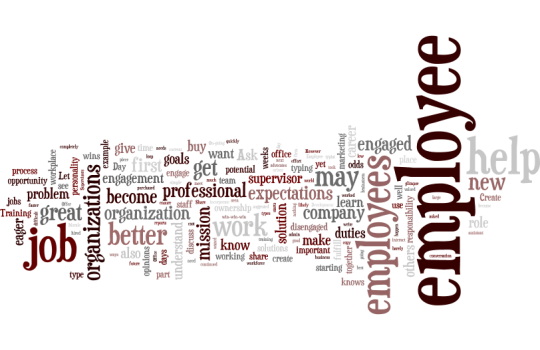 *This is part 2 of a 2 part series on employee engagement. Check out part 1 HERE. We have all seen the reports that show most employees despise going to work. There is some employee responsibility but there is also a great responsibility on the organizations shoulders. Most employers want to get the most out of their employees, yet fail miserably. The best time to help employees become engaged in their workplace is the day they start. In one of my jobs, I was eager to learn. I had never worked in this sector before, but believed it could be a great fit for me. It only took two weeks for me to realize the organization was barely surviving. Morale was low. I was unsure about my role and did not understand expectations. My engagement level waned at an increased rate as the days went by. Think about your past jobs or when you started at your current job. You were most likely excited for a new opportunity and eager to learn. If you didn’t become engaged at the beginning of your employment, odds are you became disengaged rather quickly. Going from a place of a disengaged employee to an engaged employee is difficult. How can this be rectified? Supervisors and organizations at large need to begin to engage with their employees on the first day of their job. When a new employee starts, cast vision for the employee. What is the organizations mission? What problem is the company there to solve? How does the company make the world a better place? Then share why their job is important to the mission of the organizations. Without their piece of the puzzle, “X” doesn’t happen. This will help the employee understand why their job is important. There is nothing worse than not knowing what is expected of you at your job. Within the first few days of a new employee starting, make sure you have a conversation regarding expectations. This includes attire, work habits, use of technology while at work, and general job duties. This is a great time to discuss expectations of your role as their supervisor. This can include the type of interaction you will have as well as what duties you expect them to accomplish on their own and which duties you want to be kept in the loop on. Want your employees to be advocates? Create buy in, or give them some skin in the game. When making decisions, get employees together, brainstorm, and get their opinions. If the opinions are good, use them, and give them credit. If the opportunity arises for this in the first few weeks, even better. They will sense they get to be a part of the solution and will be eager to help out in the future. A great example of this is when a supervisor wants to streamline a process. The potential changes you want to make will effect staff. Gather those staff members together and share your concerns, discuss the problem. Ask them if they see the problem. Then ask them for potential solutions. You may have a solution in mind, but a solution may be suggested which you have not thought of. When you incorporate some of their solutions, you create buy in and ownership. Your employee might be starting out in the workforce as an office admin. If it’s their first job, odds are they are not planning on staying in that role for their career. If they do, you may have the wrong employee. Ask them their professional goals. Ask them how you can help them learn a new skill which may help them move on to the next step in their career. A simple, yet great example occurred in my workplace. A supervisor asked an employee her professional goals. She said she wanted to become better at typing. A program was purchased to help her become a better typist. This helped the employee to do her job better, typing faster, allowing her to get more work done. And she felt valued in the process. Michael Scott from “The Office” would call this a win-win-win: You win, she wins, and the company wins. An office assistant was hired at a marketing firm. He knows very little about marketing, but knows he needs a job. Have him meet with others at the company who are doing the professional work. Those who are working with clients, those who write copy. Let the new employee see a glimpse of what others are doing to fulfill the organizations mission. This may also help him to understand portions of his job better. It may also give him a career goal to shoot for. Does your employee know their personality type? Do they know how to interact with others with completely different personality types? Do your employees know how to work in a team and the benefits of working as a team? Training your employees on the soft skills of business will not only help them, it will help them help you fulfill the mission of the organization. On-going training helps with continued employee engagement. An organization can only do so much to ensure the employee is engaged. It does take effort on the part of the employee as well. However, when an organization is healthy, it can create a culture that encourages employee engagement from Day 1. If you are a leader, how are you engaging with your employees? Do you think they are engaged with their work or doing the minimum to get by? Would love to hear your thoughts!